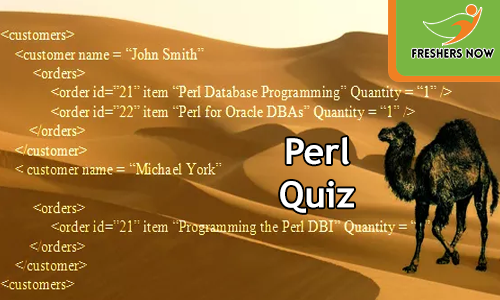 Aspirants can check their level of performance in Perl Quiz through this article. Here we are providing you with the complete information regarding the Perl MCQ Online Test, an overview of the quiz, benefits of taking the test, how to check your results, etc. Nowadays candidates are showing a lot of interest to practice quizzes to learn how to improve the time management skills. Keeping this point in mind, we are furnishing a Perl Online Test in the form of Multiple Choice Questions and Answers. Here contenders can attend the test from the beneath sections to improve their accuracy and speed. So, candidates who are interested in taking the test can go through this page thoroughly. Candidates can check the above table to get an overview of the Perl Quiz. We are providing you with the number of questions asked in the online test, time limit allocation, type of the exam, and a lot more other details. So, contenders need to check the above table before anything else in this article. Also, candidates who are willing to practice the test can move to the next section, but before that try to check the instruction that is present in the next session. Here we are providing you with some instructions that you have to follow while taking the quiz. There is no time limit to complete the test. The total number questions are 25 questions. Also, there are no negative marks. Candidates have to click on Submit Test for submitting your answers. If you do not do so, the results will not be displayed on the screen. In addition to this, candidates should not refresh the page during the time of the test. Otherwise, there is a chance of losing answers that you have mentioned earlier. 1. Which of the following data types are preceded by a dollar sign ($) in Perl? 3. Which of the following operator checks if the value of left operand is less than or equal to the value of right operand, if yes then condition becomes true? 4. It is often more convenient to save perl program files with ____ extension. 6. Which of the following method remove the elements of @ARRAY designated by OFFSET and LENGTH, and replaces them with LIST, if specified? 8. What is the facility that allows nesting one select statement into another? 9. To repeat a string, perl uses ___ operator. 10. For extracting a substring, ____ function is used. 11. To combine multiple retrievals, which keyword is used to write several SELECT statements between them? 13. What will be printed by the code below? 14. What is a file handle used for? 15. Arrays are denoted by _______in Perl. 16. Which function is used for handling substitutions in perl? 18. ___ function returns the first occurrence of a character in a string. 19. When the “require” function loads? 22. Which of the following file test operators can be used to check if a file is a text file? 23. Which function is used by perl for displaying the length of a string? Perl start for Practical Extraction and Report Language. Also, it runs on various platforms like Windows, Mac OS, and multiple versions of UNIX. It is used for mission-critical projects in both public and private sectors. And, Perl is extensible, it supports Unicode, and is Y2K compliant. It also supports both procedural and object-oriented programming. Improve Speed, Accuracy, and Versatility. Learn the skills to solve a problem. Maintain proper time management which is essential to qualify any campus interview. Results can be checked on the quiz page, as soon as you click on submit the test. Candidates have to know that, if you do not submit your test, then you cannot check your results.